I recently wrote a book review of John Piper’s new book Bloodlines and in that review I said it was a book that changed the way I view how the Gospel relates to all areas of life, especially racism. 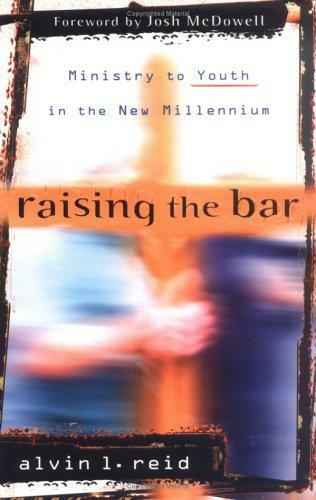 After reading Bloodlines I decided to read Raising the Bar by Alvin Reid. This book also changed my thinking, but about student ministry. I got this book awhile back, but have not been able to read it. There hasn’t been many student ministry books that have impacted me like this book did! After reading this book, my excitement and passion for student ministry as grown and I feel more prepared to disciple and reach students with the Gospel. It is no surprise that modern student ministry has failed to produce life-long disciples of Christ. Sadly, most students leave the church and their faith after they graduate high school and leave our youth groups. In Raising the Bar, Reid pleads with student pastors and parents to raise the bar for our students. Kristin, age 17, says, “We know how to be teenagers. We want the church to show us how to be adults.” This quote is mentioned numerous times throughout the book and it sums up the basis on this book. It is time for students pastors to raise the bar and start training students to be adults who own their faith and become life-long followers of Christ. Reid breaks this book down into two parts: Test Time: Does Youth Ministry Pass? and Reinventing Youth Ministry. In part one, Reid begins by explaining who modern student ministry is reaching: the millennials. Then he spends a few chapters talking about how we should expect more from students and from history, especially Biblical history, we know that students are capable of doing great things for God! In a recent blog post I shared about how God usually chooses younger people to be leaders and do great things for Him (Click here to see that post). Reid then ends part one with a discussion on the Jesus movement that swept our nation in the 70’s. This was my favorite part of the first part of this book. I never really learned about the Jesus movement and Reid helped me understand how most modern ministry finds its roots in the movement. Throughout part one, Reid doesn’t bash student ministry all together, but he does point out how it has failed. That is why it is time to raise the bar in student ministry. In part two, Reid talks about how we should raise the bar and what do we raise it to. Reid gives four main areas were we must raise the bar in student ministry: prayer, Bible knowledge, evangelism, and worship. Instead of going through each of these and sharing Reid’s thoughts, I want to point out the two that was most helpful to me. First, evangelism is one area I personally struggle with. Because of that, I need to be intentional and push myself to grow in this area so my students can learn from me. Reid talks about how evangelism is exciting for students! Students want to share their faith, but they need instruction and an example from the adults above them. Second, I was extremely encouraged by the Bible knowledge part. For far too long, student ministry has been about “behavior modification” rather than teaching theology from God’s Word that changes belief. Right belief based on God’s Word, will bring about right behavior. Reid talks about how student pastors need to be well-trained in Biblical history, language, and theology so we can train students to be life-long followers of Christ! Student pastors should be trained just as well as a senior pastor! I encourage anyone involved in student ministry to read as much student ministry related books possible. But if there is a book you MUST read it is this one! This book will help you understand why student ministry needs to raise the bar and do better than what we have done in the past. It’s a great read that will challenge you personally and the ministry God has put you over. Go on over to Amazon and grab you a copy of Raising the Bar by Alvin Reid. Anything Doc Reid puts out is worth reading! Great man who lives what he preaches and writes! This is the first book of Dr. Reid I have ever read. Want to read some more! Thanks for reading and leaving a comment!